What you need: Simply add milk and in under an hour you will be eating and sharing your very own fresh cheese! No aging required! Pasteurized store-bought or raw farm-fresh milk both work. Make sure your store bought milk is not ultra-pasteurized or UHT, ultra-heat pasteurized. Dietary guidelines: The Mini Farmers’ Cheese Kit is gluten-free and vegetarian friendly. Quantity: The Mini Farmers Cheese Kit makes 3 batches of cheese. A batch is about 1 lb so you will have plenty of supplies to try your hand at not only making the cheese but experimenting with different flavors, shapes and recipes. Use bowls, cupcake tins etc. as molds at home. Good to know: One of the many unique characteristics of this cheese is that it doesn't melt, so you can actually pan-fry cubes for a browned, crispy, chewy, crazy good treat. Use it instead of croutons on a crisp green salad, fry it like an egg for an amazing sandwich, replace meat or tofu in any dish or just dip cubes as appetizers in a delicious sauce (BBQ, plum, pesto, salsa...) You can make a veggie dip, ricotta cheesecake, mix with jam and top pancakes, use it savory to fill pasta shells, dollop onto chili, layer in lasagna, or crumble onto salads like feta. The possibilities are endless! FOOD SAFETY AND HANDLING: The kits and supplies are hand-poured, hand-folded and assembled in a food-safe, fully-licensed facilities that strictly follow the Department of Agriculture cleaning guidelines. The food items are all gluten-free but packaged in a room that may come in contact with wheat, soy, corn, nuts and other food allergens. 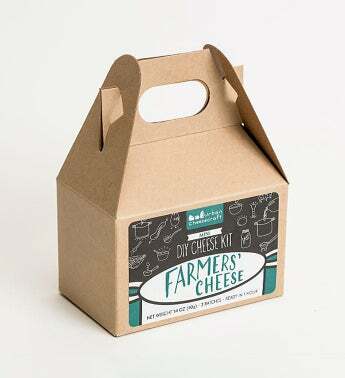 Shelf life for the Mini Farmers’ Cheese Kit is 5 years. It may be teenie* but this Mini Farmers’ Cheese Kit is packed with fun and cheesy possibilities. This cheese is fittingly rustic and very adaptable. It can vary from ricotta to feta in flavor and texture.